It's that time again! Time for the Pinterest Challenge: Winter Edition. 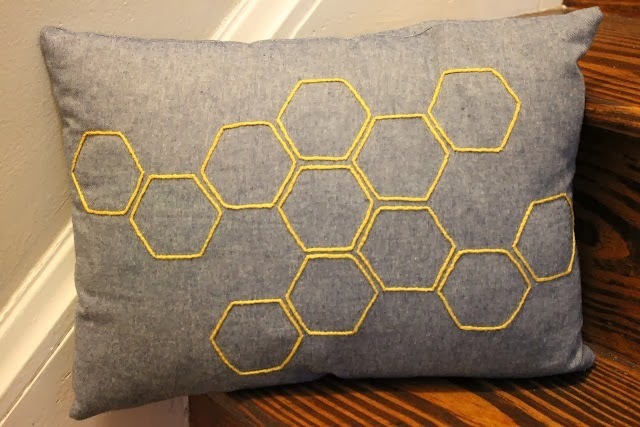 I thought I'd share a little project I made from a picture that I pinned a couple months ago of this adorable beehive design pillow. The picture was actually taken by Michelle during a visit to the store Ninush in Las Vegas. Practically everything in there needs to be pinned, it is all so neat. But, the little beehive pillow caught my attention and I thought it would be great as a little homage to our bees, (who unfortunately didn't do so well over our very mild winter, I promise to write all about them when it gets warmer out and we can get some good pictures). 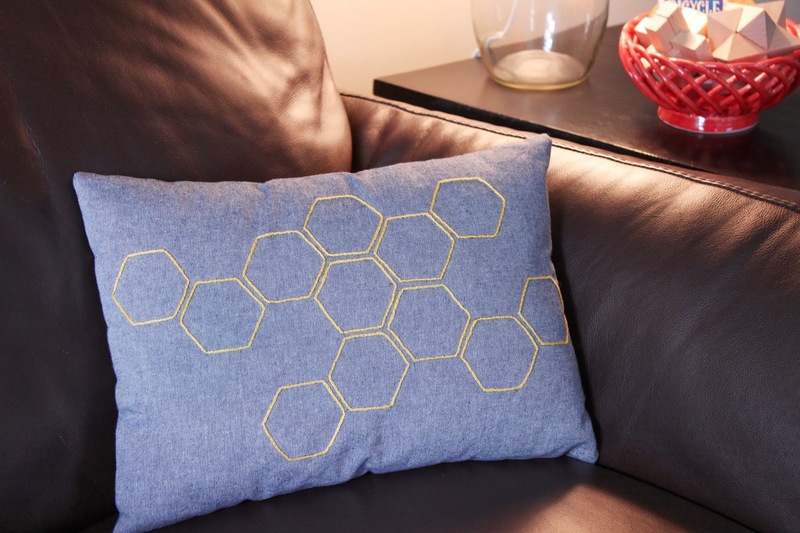 I assumed the hexagon detail was embroidered on to the pillow, so that's the route I took. I ran to JoAnn's and got some fabric, a pillow insert (not pictured), an embroidery hoop, needles, and yellow thread. I loved the gray and yellow color scheme, but found this really cool blue denim fabric that I thought would look great too. I bought a smaller pillow accent pillow because I planned on putting this on a chair that isn't used a lot, (partly because I don't want to risk messing the embroidery up on a pillow that gets a lot action). 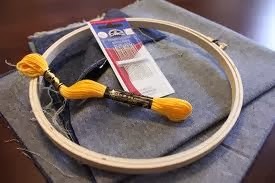 Even though I haven't embroidered anything in years (my mom and grandmother are super crafty, so I've grown up trying different things and I have vague memories of embroidering), it's not that difficult and I only had to go to the internet to refresh my memory on stitches. I found a ton of tutorials on different stitches and finally decided on the split stitch since it's great for items that get a lot of action, like clothing or pillows, since each stitch locks in the stitch before it. 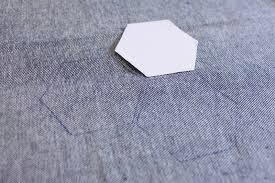 So, once I had a plan, I cut out a few hexagons in a size I thought would be easy to embroider and look nice, and laid out a design I liked. There wasn't really any rhyme or reason, I just winged it. Once I got the design I liked, I cut one hexagon out of some cardboard and used this as my template. 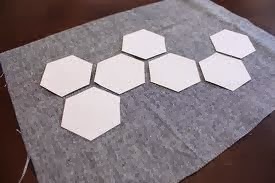 I drew all the hexagons using a white fabric pencil (I used a blue pen below so it would show up in the pictures) and put the fabric in the loop. The stitch is super easy and became pretty mindless after a while. You start with the first stitch, then bring the second stitch back up through the middle of the first stitch. Then you complete the stitch. Then come back up through the middle of the last stitch. It should be right next to the ending stitch of the previous stitch. And then continue until you've completed the hexagon. For the most part, the corners lined up pretty nicely, but sometimes I would have to shorten my stitch at the end to be able to make the turn. Since you can't really see the separate stitches, it's fine. 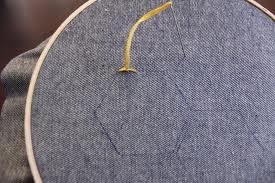 I would sew a couple hexagons while we were watching TV and it only took me a couple of nights. 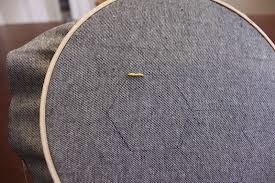 Once I filled up all the completed hexagons within the loop, I would move the loop until I finished all 12 shapes. After I finished the embroidering part, the rest was easy. I simply sewed 3 1/2 edges on the sewing machine (with the right sides together), turned it inside out, stuffed the insert into the pillow case, and hand stitched up the hole. Not to sound like an old lady, but I really liked embroidering. It was relaxing and gave my hands something to do while we watched a movie or I caught up on the Housewives of Where Ever. Here's a closeup of the stitching, which has held up really well with the light use, (and my occasional petting as I walk by). The stitch makes the design pretty 3-dimensional, so it's neat looking and fun to touch, although I am pretty sure Mike has never "petted" it, or any other pillow we own. And finally, a shot of the pillow in it's home on the chair in the living room, (which was a little hard to photograph due to the weird lighting). I love the way it turned out, and love showing off our love for our bees! To see the host's projects, and everyone else who played along, check out the links below! Erin (The Great Indoors), Katie (Bower Power), Sherry (Young House Love), and Cassie (Hi Sugarplum). Cute! I love it. Your embroidery is just perfect. Love this! Definitely something I'll pin and add to my list of projects to try! Awesome! I saw this linked on YHL. I must do this project! I LOVE this project!! 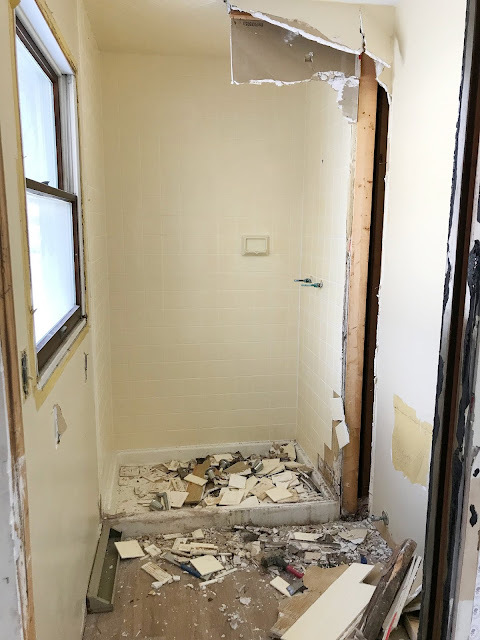 Thanks for the recap of your work! Its very cute! I love bees too so I was instantly attracted to this one, I'd love to keep my own bees someday. 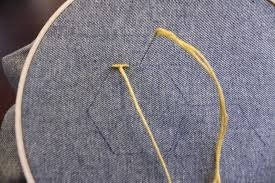 Thanks so much for showing how to do the stitch, I almost gave up before I finished reading but you made it easy! I was soooo going to do an embroidered pillow for my Pinterest project too...but then I ended up doing nothing. Boo. But when I saw your picture in the link party I had to come check it out. 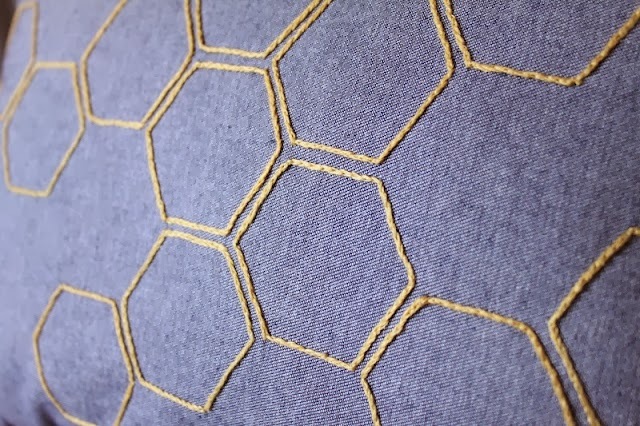 Love the hexagons...I couldn't decide if I was going to hand embroider or do some free-hand machine quilting. So cute! I made pillows too! I have a (soon to be) gray and yellow setee and this pillow would look so cute on it! Thanks for explaining how to do the stitch! This is so cute!! 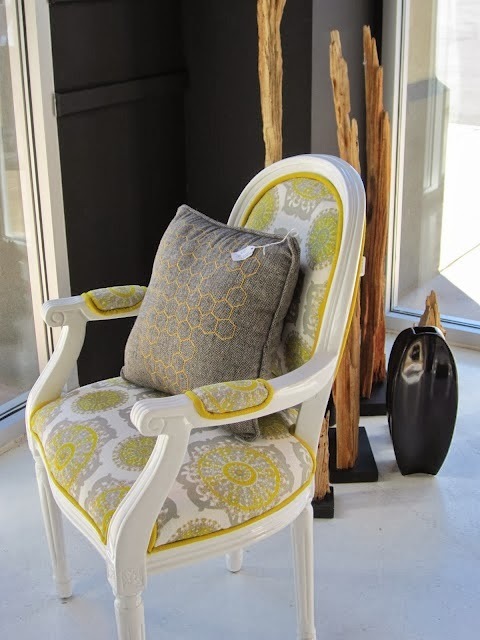 I have a thing for bees and beehive decor...the yellow is so fun for spring too! 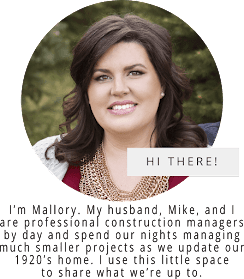 Thanks for sharing and linking up! This looks so great! On my (never-ending) to-do list is to make some pillows for the sofa in my craft room... I may just have to try my hand at embroidering! Cool! This project makes embroidery a little less scary-- my grandmother does really intricate embroidery projects that scared me out of doing it. Great job, and thanks for linking up with the Winter Pinterest Challenge! I bet bee-loving Sherry loved this one! That's so cute! I love the bee hive idea! Wow I don't know how to sew but I think I could do this! Cute!